This edited volume presents a comprehensive and coherent interdisciplinary analysis of challenges and possibilities for sustainable governance of the Baltic Sea ecosystem by combining knowledge and approaches from natural and social sciences. Focusing on the Ecosystem Approach to Management (EAM) and associated multi-level, multi-sector and multi-actor challenges, the book provides up-to-date descriptions and analyses of environmental governance structures and processes at the macro-regional Baltic Sea level. Organised in two parts, Part 1 presents in-depth case studies of environmental governance practices and challenges linked to five key environmental problems - eutrophication, chemical pollution, overfishing, oil discharges and invasive species. Part 2 analyses and compares governance challenges and opportunities across the five case studies, focusing on governance structures and EAM implementation, knowledge integration and science support, as well as stakeholder communication and participation. 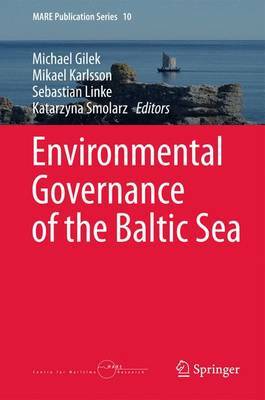 Based on these cross-case comparisons, this book also draws a set of general conclusions on possible ways of improving the governance of the Baltic Sea by promoting what have been identified as vital functions of environmental governance: coordination, integration, interdisciplinarity, precaution, deliberation, communication and adaptability.